We have a sign-up sheet in our office. Please call or stop by to add your name. Once we have enough students, we will set a date to begin. This class will teach you the information you will need not just to pass the instrument knowledge test, but also to fly safely in the instrument environment. Some homework, in the form of extra reading, is required. Cost is $300.00 for the complete 10-session ground school. You can also pay per class at a drop-in rate of $30. Please call the office to enroll or use PayPal above. Many of these items can be downloaded for free by clicking here for our Documents webpage. 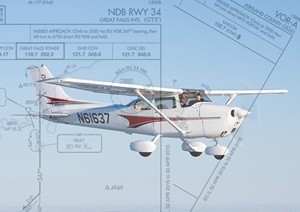 You can also download or print charts and approach plates by visiting the FAA’s website. Licensed pilots who want a refresher are welcome to attend.